Things have changed in the job market. Things continue to change. And the rate of change is quickening. Unless you’re aware and prepare, these changes can catch you by surprise and be devastating to you. 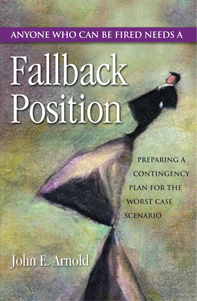 That’s why I wrote Fallback Position. I’d seen too many people laid off or fired unexpectedly and being unprepared were devastated emotionally and financially. Does that sound familiar? When push comes to shove, when it’s a matter of survival, the friend who hired or supervises you will think of his or her career, reputation, and the organization before thinking of you. If any of those are perceived by the boss to be better off by cutting you loose, by whatever euphemism, then you’re toast. That’s a reality in today’s volatile work environment. And that’s why everyone needs to know how to prepare so they prosper through change. I know what it’s like to be fired. And how to prepare for it. Over 9 million people heard the phrase “you’re fired” the past few years. Not just from “the Donald.” 2 million in 2012. 5 Industries most at risk? Aviation, Construction, Finance, Technology, Manufacturers of Technology, Media. What jobs are stable? Long term, not many. Change is happening faster and faster. Those with the personal touch will be around: health care, personal services, retail, sales.